The Simex Flexi mail sorting system offers unrivaled performance at an unbeatable price. It comes in the perfect configuration to meet the highest standards of value-driven service providers in the private and national mail processing business. The modular system allows a reliable throughput of up to 30,000 items per hour with a maximum thickness of 20 mm and processes applications from the small DIN C6 or #7 3/4 format to the large DIN B4 or Flats format. Larger mail like magazines, newspapers, catalogs or polywrapped items are also sorted effortlessly. The system’s high level of flexibility and modularity makes it easy to adapt it to customer specifications. Simex Flexi is – like all BÖWE SYSTEC sorting systems – operated with the easy to use software BÖWE Sort. 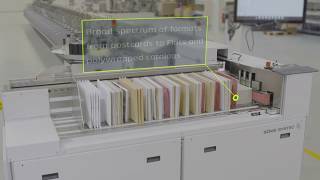 Simex Flexi offers professional and secure mixed mail sorting at maximum performance level. The straight line transport ensures items are processed without damage. The advanced feeder separates different types of mail – from standard letters to 20 mm thick, poly-wrapped catalogs – reliably. At a speed of up to 30,000 items per hour, guiding channels guarantee gentle and constant material flow, keeping the reject rate to a minimum. Market-leading OCR reading technology ensures the highest read rates and maximum security for the complete sorting process. Simex Flexi’s extraordinary flexibility and modularity make it easy to adapt the system to individual customer needs and retrofit as necessary at any time.